Heritage Training and Shooting Center is celebrating their two-year anniversary by celebrating the entire month of August 2017 as Customer Appreciation Month! To help members and customers celebrate their anniversary and as part of giving back to the individuals who have supported them, Heritage is offering several fun and competitive events. Fun Target Tuesdays is an exciting and challenging event where customers can use various fun, but technical targets to test their skills at Heritage shooting range. Also on Tuesdays, they will be offering ½ off Marksmanship Simulation Sessions that focus on skill building using their state-of-the-art TI Simulators. In addition, they will be holding their first Annual Summertime Shooting Raffle on August 1st, 2017 that benefits The Wounded Warriors Project. Participation involves a $5 donation that will provide one entry and provide an H-6 target that is used for the raffle. First Place: 2nd Anniversary Heritage Custom Glock 19. Second Place: $250 Heritage Gift Card. Third Place: $100 Heritage Gift Card. Fourth Place: $50 Heritage Gift Card. Fifth Place: $25 Gift Card. This raffle ends on the last day of August 2017. Winners will be notified the first week of September. Also, in honor of Customer Appreciation Month, Heritage will be offering free Informational Clinics every Saturday in August - focusing on the right accessories, self-defense items, ammo and more. The Clinics are for people of all skill levels. Stop into their retail department on Saturdays in August from 11am-1pm to “Arm Yourself with Experience”! Heritage offers their customers the opportunity to rent Heritage firearms for use on their range and for participation in their Customer Appreciation Month events. Additionally, guests can bring their own firearms and ammunition, (with minor limitations) for use on their shooting range. 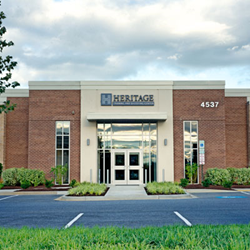 Heritage Training and Shooting Center is located at 4537 Metropolitan Court in Frederick, Maryland. With state-of-the art shooting ranges, technologically advanced classrooms, TI Simulator, a firearms retail store, and rental center. Heritage has everything you need to meet your personal protection goals. For more information, visit their website: http://www.heritagetrainingcenter.com.